(2019) I learned a valuable lesson decades ago when I flew halfway around the world to see the places my grandparents grew up. While sat at a Thai restaurant the pianist asked for requests. We commented on his fluent English and he responded that he was American. He developed further that he was a Texan. Here I was halfway around the world giddy at the fact that an American was playing piano. This is how I learned the effect of one person seeking out similarities in others. I stopped short of asking if he knew anyone I did; he was from the largest state in the lower 48. But it didn’t stop friends in high school from doing likewise in similar situations. Oh you’re front Pennsylvania? Do you know so-and-so? He lives in Pittsburgh (for those keeping score that town is 360 miles away). I would follow up with the fact that Pennsylvania was a large state and all that other stuff. People want to find similarities such as knowing the same person from another state. What are the chances? The chances are slim – see: nonexistent – that we know anyone from linden & true coffee. It is highly doubtful we have competed in the same events as the four athletes behind the company. Perhaps the only similarity is that at this moment it is likely we are sharing the same continent with Des, Ryan, Sarah, and Ben, the linden & true coffee front-runners. On their page they are described as Olympians, marathon winners, and cyclists who climb epic mountains. Essentially we would never run into them; they would be well up the road. 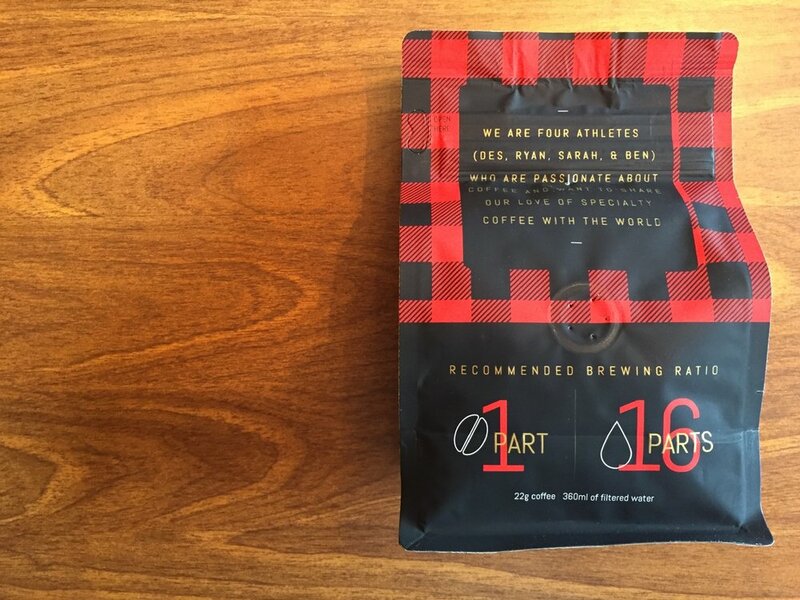 We brew our coffee a little stiffer than the recommended brewing ratio, but 1:16 is a good benchmark. So when a bag of linden & true coffee fell into our hands over the winter break, we were extremely excited. If ever there were a profession for athletes, coffee roasting would be it. With attention to splits, knowledge of watts, and a determination of whether coffee would be consumed mid-ride on the flattest course possible, endurance athletes are the personalities to make a proper cup possible. Here I am getting giddy at the fact endurance athletes are making craft coffee. In the winter, flannel is a must at the offices of creakybottombracket.com. If we’re not wearing our Belgian Crew hoodie, we don the plaid patterns of lumberjacks and proclaim that everyday is casual day. Our linden & true bag arrived sporting the quintessential red and black plaid associated with Vermont and maple syrup. Indeed Ted King has even posed with a bag of it on social media. And don’t think we won’t get after a linden & true flannel hat to complete the look. Dogfish Head Brewing named a seasonal beer after this look: Pennsylvania Tuxedo. What came after opening the bag of Ethiopia Yirgacheffe was a wonderful aroma of freshly roasted coffee. The beans were a lovely color of fallen crunchy maple leaves with the dryness to boot. This was going to be a great cup of coffee. Despite their suggestion of 1:16 ratio of beans to water I went with my standard heavy dosage. The sweet aroma that greeted us out of the bag also wafted out of the mug. But did the flavor profile match the presentation and aroma success to this point? I have made several cups of linden & true coffee since receiving the bag. I joke that the flavor is still hanging around hours later. The self-described sweet flavors of peach and honey certainly come through. The tart cherry profile round out sips to leave a rich aftertaste. As a matter of fact this is one of the sweetest coffees tasted in the office. Linden & true recommend drinking the first cup without cream or sugar then adjusting to your preference afterwards. I like that approach. You adjust to the coffee, not the other way around. There are other roasts in the lineup worth checking out. We will certainly have to add linden & true brews to the coffee shelf when other roasts are described as chocolate maple syrup. This company talks my language. While I am at it I will confess that linden and true coffee whispered in my ear as the Rapha Festive 500 imploded on the waning rides. Turn right for a longer route or turn left for home and some specialty Ethiopian Yirgacheffe? I didn’t make it to 500 kilometers, so which do you think I went with? Linden & true are endurance athletes from both Michigan and New Hampshire. The chances of us sharing the same ribbon of road as they do are possible but unlikely. The closest I’ll get to their palmares is through a bag of craft roasted coffee. And I didn’t have to go halfway around the world to find it.